Ladies Souvenir of Apollo Commandery, No. 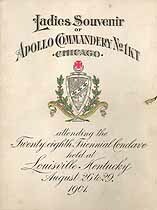 1, Knights Templar, Chicago, attending the Twenty eighth Triennial Conclave held at Louisville Kentucky, August 26 to 29, 1901. Names in this online transcription include Abbott, Billow, Booth, Bruske, Buehler, Comstock, Crego, Crooks, Edmunds, Haigh, Haines, Johnson, Kellogg, Loomis, Lusch, May, Miller, Powell, Russ, Sawyer, White, Woodman. The Genealogy Today catalog number for this item is 16200. When inquiring about the information in this resource, please mention the catalog number.